Annelise Riles, executive director of the Buffett Institute. Riles responded to criticisms from Faculty Senate members at Wednesday’s meeting. 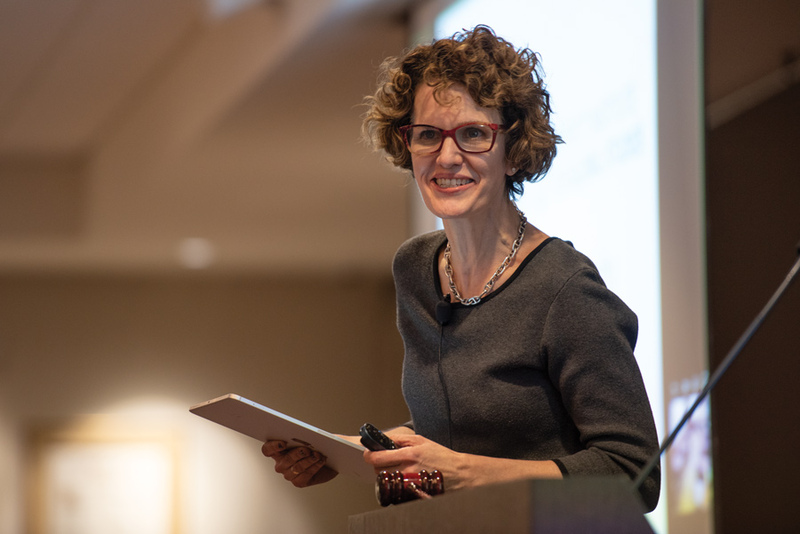 Faculty Senate members criticized recent changes to the Buffett Institute for Global Studies after a presentation by Annelise Riles, the Buffett Institute executive director, at Wednesday’s Senate meeting. Six faculty members questioned Riles, raising issue with the direction she has taken the Institute since her she assumed the position in September. The questioning lasted for nearly half an hour, until Faculty Senate President Baron Reed intervened to end questioning before Faculty Senate’s 7 p.m. end time. Political science Prof. Laurel Harbridge-Yong said she had seen numerous programs in the political science department lose their funding from Buffett as well as a decrease in support for graduate students. “In talking with my (political science) colleagues, I can honestly say I’ve never seen so many people upset,” she said. Some faculty in the political science department said they feel that the Buffett Institute was moving towards “PR, marketing and gimmicks” at the expense of research, Harbridge-Yong added. In response to Harbridge-Yong’s remarks, Riles said the Buffett Institute had not abandoned research in the interest of public relations, arguing that — prior to her leadership — the Institute had become a means for funding speaker events instead of sponsoring research. She added that funding for graduate students had not been cut, but criticized the ease with which graduate students had previously received funding from the Institute. “We are absolutely committed to research,” Riles told The Daily about the Institute. Riles’ presentation before the questioning discussed Northwestern’s placement in the Times Higher Education World University Rankings and did not address changes to budgeting procedure at the Buffett Institute. In an interview with The Daily after the meeting, Riles said the institute has a “new set of processes around budget allocations, spending, procedures for getting approval, that sort of thing.” Riles said she was operating in her capacity as associate provost of Global Affairs, a position she also holds. The Institute was founded in 2015 with a more than $100 million donation from Roberta Buffett Elliott (Weinberg ’54). The Institute has since played a central role in the University’s ambitious effort to expand its global presence. During the meeting, art history Prof. Claudia Swan raised further issue with Riles’ comments on the Institute’s speaker events. Swan singled out Riles’ critique of speaker events, arguing that such events had the potential to lead to further collaboration, and questioned how the “incubation workshops” Riles proposed in her presentation differed from the previous system. In response, Riles said the Institute does not have the administrative capacity to handle the number of speaker events previously handled by Buffett, reiterating that speaker events were not the Institute’s priority. Faculty Senate members from the sociology and history departments, the Medill School of Journalism, Media, Integrated Marketing Communications, and the Kellogg School of Management also questioned Riles. Students have also said that community organizations housed at the Institute faced a setback with budget cuts, prompting the Associated Student Government to explore ways to support them. “There are people who are not going to be thrilled with the direction we are going, and I understand that,” Riles said. Faculty Senate also heard a presentation from the Advisory Committee on Investment Responsibility given by its chair, Dr. Philip Greenland. The ACIR advises the Board of Trustees on investment decisions based on proposals made to the committee, Greenland said. In addition, all the senators present voted in favor of an amendment implementing procedures for the removal of a Faculty Senate president. However, not enough senators were present to pass the amendment. A previous version of this article stated that Annelise Riles’ presentation did not address changes to procedure. The presentation contained changes to the structural procedures of the Buffett Institute for Global Studies. The Daily regrets the error.